The intelligent technology beams a series of projections onto the road to show the future intentions of the vehicle – for example stopping and turning left or right – as part of research into how people can develop their trust in autonomous technology. In the future the projections could even be used to share obstacle detection and journey updates with pedestrians. These projections, tested on autonomous pods developed by Coventry-based Aurrigo, feature a series of lines or bars with adjustable spacing. The gaps shorten as the pod is preparing to brake before fully compressing at a stop. As the pod moves off and accelerates, the spacing between the lines extends. Upon approaching a turn, the bars fan out left or right to indicate the direction of travel. 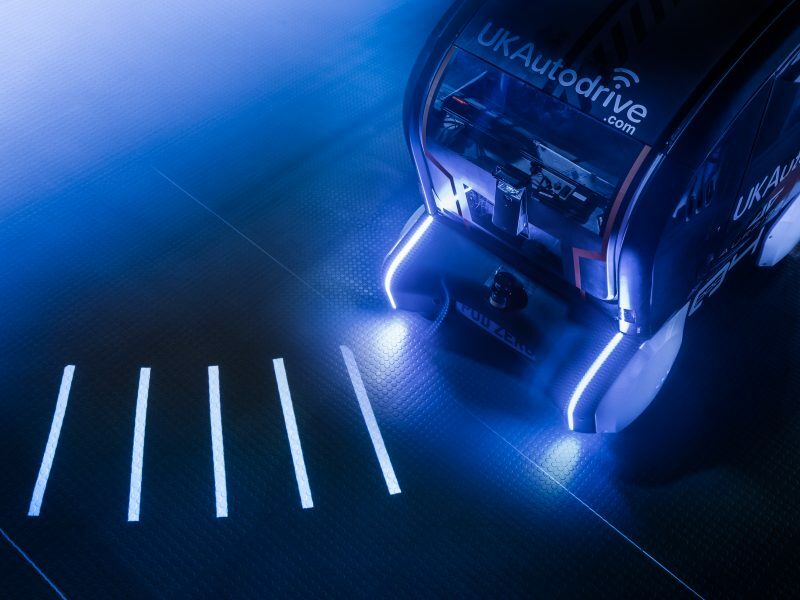 The trust trial programme – which also included fitting of ‘virtual eyes’ to the intelligent pods in 2018 to see if making eye contact improved trust in the technology** – was conducted as part of Jaguar Land Rover’s government-supported UK Autodrive project. “The trials are about understanding how much information a self-driving vehicle should share with a pedestrian to gain their trust. Just like any new technology, humans have to learn to trust it, and when it comes to autonomous vehicles, pedestrians must have confidence they can cross the road safely. This pioneering research is forming the basis of ongoing development into how self-driving cars will interact with people in the future,” commented Pete Bennett, Future Mobility Research Manager at Jaguar Land Rover. Miles Garner, Sales and Marketing Director at Aurrigo, added his support: “Our autonomous pod technology is fast becoming the market leader in ‘first and last mile’ transport solutions and this has been reinforced by a number of deals to supply Pod Zero to customers in Singapore, Vietnam, Canada and, most recently, the US. “The discussion about driverless vehicles is continuing to grow in intensity and we are delighted to be working with Jaguar Land Rover to install intelligent systems on to our pods that will project images depicting the direction of travel.